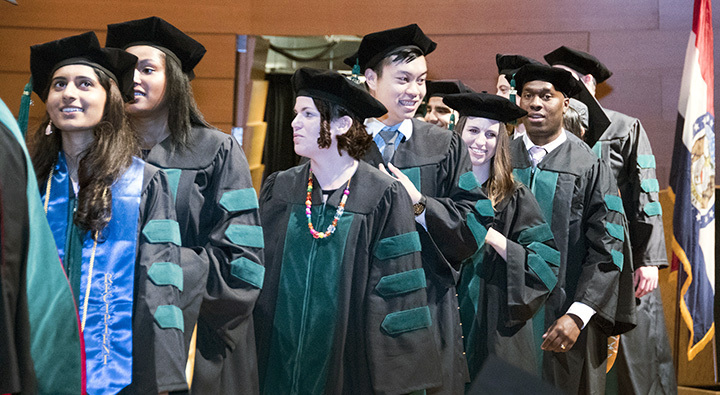 Members of the School of Medicine Class of 2018 line up to have their names called during the Commcencement ceremony on May 21 at the Kauffman Center for the Performing Arts. In his final commencement address as UMKC School of Medicine Dean, Steven L. Kanter, M.D., applauded the Class of 2018 for its accomplishments and welcomed the graduates to the health care profession on May 21 at the Kauffman Center for the Performing Arts. The School of Medicine recognized more than 150 graduates with degrees for doctor of medicine, masters in anesthesia, bioinformatics, health professions education, physician assistants, and a graduate certificate in clinical research. Kanter, who will assume the role of president and chief executive officer of the Association of Academic Health Centers and the Association of Academic Health Centers International (AAHCI) on July 1, reminded the graduates that they are now part of a rich legacy and long-standing tradition of outstanding alumni of the School of Medicine. One of those alumni, Michael Hinni, M.D. ’88, spoke to the class as the 2018 E. Grey Dimond, M.D., Take Wing Award winner. A renowned surgeon and chair of the Department of Otolaryngology Head and Neck Surgery at the May Clinic in Scottsdale, Arizona, recounted his time at the School of Medicine how it prepared him for his current role in medicine. Specifically, to the more than 110 new physicians, he encouraged them to trust themselves and their education. He said he was more prepared than he imagined when began his residency because of his vast training at the School of Medicine. Three students from the School of Medicine received their degrees and participated in the UMKC Mid-Year Commencement Ceremony on Dec. 16 at Swinney Recreation Center. Apurva Bhatt and Claire Smith received their Doctor of Medicine degrees, and Deborah Montgomery received her Master of Science in Bioinformatics degree. The combined mid-year ceremony honored graduates from the Conservatory of Music and Dance, Henry W. Bloch School of Management, School of Biological Sciences, School of Computing and Engineering, School of Education, School of Law, School of Medicine, School of Nursing, School of Pharmacy and the School of Graduate Studies. The School of Medicine’s spring graduation ceremony is scheduled for 3 p.m. on May 21, at the Kauffman Center. 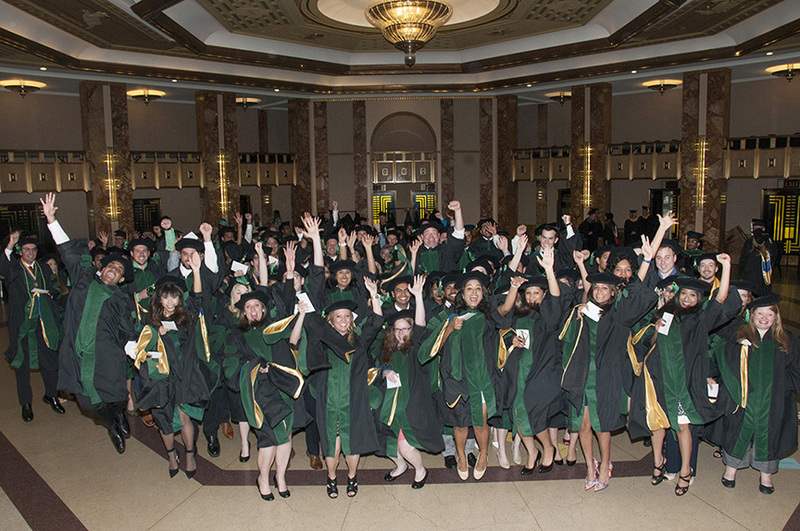 The School of Medicine Class of 2015 celebrates its upcoming graduation on May 20 and the Kansas City Music Hall. In his first commencement address to graduating students of the School of Medicine on May 20, Dean Steven Kanter, M.D., welcomed the Class of 2015 to the medical profession and encouraged each one not to sell themselves short. As the keynote speaker, the first-year dean congratulated a class of more than 130 students receiving their medical degrees, master’s degrees in anesthesia and bioinformatics, and graduate certificates in clinical research. Kanter told those about to enter the medical profession that they are heirs of the longstanding traditions of excellence established by those who had graduated from the School of Medicine before them. Providing care, he said, is only part of the role. As health care professionals, the graduates will also serve as healers, helpers and advocates for the sick. Timothy Buie, M.D. ’84, recipient of the 2015 E. Grey Dimond, M.D., Take Wing Award, told the graduates that joy in life will come from the adventure itself and, while they may have a plan for their lives, they should be open to whatever opportunities may come. Lance Brandenburgh, M.D. 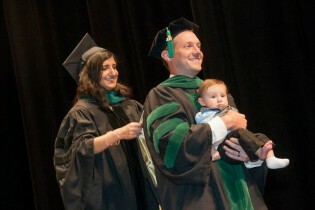 ’15, is hooded by his docent, Fariha Shafi, M.D., while holding his son, Beau, at the School of Medicine’s commencement ceremony on May 20 at the Kansas CIty Music Hall. Medicine graduates were hooded by their individual docents just prior to the full class reciting the Oath of Physicians. For one grad, Lance Brandenburgh, the ceremony became a family affair as he carried his son, Beau, with him on the stage when he was hooded by his docent, Fariha Shafi, M.D. UMKC Chancellor Leo Morton addressed the graduating class as well, saying that it had distinguished itself as a group of scholars, community volunteers and leaders. He said the graduates are well-prepared to meet the demands of a world that will expect a great deal of them. “I know that you are up to the challenge,” Morton said.